There is a vast number of the places in the world which a photographer caring about his or her artistic development should visit. Florence, for the beginning. Not only for the eyes pleasing Giotto’s frescos, not for the monumental sculpture of David, and not only because one may easily meet the ghosts of Machiavelli, Galileo and Michelangelo who were buried in the place. One has to visit Florence for the ultimate experience – The Uffizi Galler. The Gallery is squeezed among narrow streets of the city center, and it was designed to become an art gallery from the very beginning. The gallery seems to be relatively small when compared to the museums of Paris, Berlin, London and Madrid. The building is small enough to skip both the old yet inferior things, to skip antiques that are “ordinary”. it is not the place for that sort of things. The walls are reserved just for the human genius. When in 1817 the place was visited by a French writer, known under his artistic alias Stendhal (Marie-Henri-Beyle) he was able to look at, or to stand those examples of the ultimate art only for 20 minutes. Seconds later he lost his consciousness and finally fainted. This experience was later defined as the Stendhal Syndrome. A photographer should also take such a journey – to take a look at the best examples of art of painting, composing, using the colours. To decipher the secrets of using the light called luminism. But above all – to experience an afterthought about his or her creativity, about the place he or she is at the moment or is heading to, and about the things one should concentrate the efforts. It seems that the Uffizi Gallery is the place where you can answer these questions more easily. Conclusions simply come to your mind, it is just enough to buy the entry ticket. It seems that there is nothing that could replace such an experience. The experiences substantially different from the ones which you can have when liaising with modern art which quite often is just a plain form and colour. At least – to me. Also – searching for a content in new, sometimes called avant-garde art seems to be a useless effort. The Uffizi is different. Every painting by Titian, Raphael, Caravaggio or Leonardo da Vinci speaks volumes. The authors of those masterpieces were educated men. They had to be. Otherwise there would not have been able to interpret so precisely, so spot-on The Book, historical events, present specific signs, show meaningful gestures and things. But what to do if we want to stretch out this peculiar experience over seven days of the week, and by the way saving on expensive flight tickets? 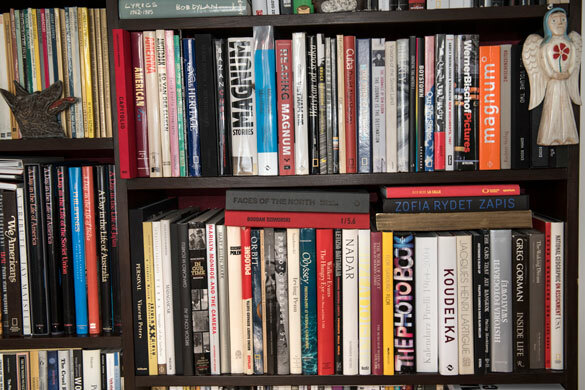 Of course, you can start with collecting books about the art of painting. But also – you can start collecting the albums containing the best examples of the real photography. I have been doing so for years. You can find these albums scattered all over my place, opened up, easily accessible on daily basis: on the way to the morning shower, to the kitchen, to the workplace. I leave them open showing the photos which echoed to me somehow “loudly” yet still I have not finished “reading” them completely, which I have not understood ultimately. I have a strange feeling that I notice only those things that I can comprehend, that I can name, that I believe in. It means that I cannot notice everything right away, say nothing about understanding it, deciphering it, reflecting on it. I return to those difficult photos until the moment, highly desired, when the mysterious things stop being the secrets to me. It is a real buzz, the moment like this. As you may see – photography may have different purposes. It may be informative, it may unveil the secrets of the world, rise a desire and admiration. Good photography reinforces afterthought. So – let us collect exactly this type of examples – the books with the best photos, in order to learn what has already been created in a perfect, ultimate way, where not to waste your time trying to “reinvent the wheel”. Josef Koudelka, Diana Arbus, Gracia Rodero, Sebastiao Salgado, Ernesto Bazan, Henri Cartier-Bresson, James Nachtwey, Roger Ballen, Alex Webb, Gilles Peress.